Caribou – Joan D. Bishop, 84, died June 27, 2018 at Maine Medical in Portland surrounded by her loved ones following a brief illness. She was born at Connor, February 23, 1934 the daughter of the late Paul and Caroline (King) Thibodeau. She attended Connor School and was a 1951 graduate of Caribou High School. Mrs. Bishop was a telephone operator for New England Telephone for 15 years and then retired from Control Devices. 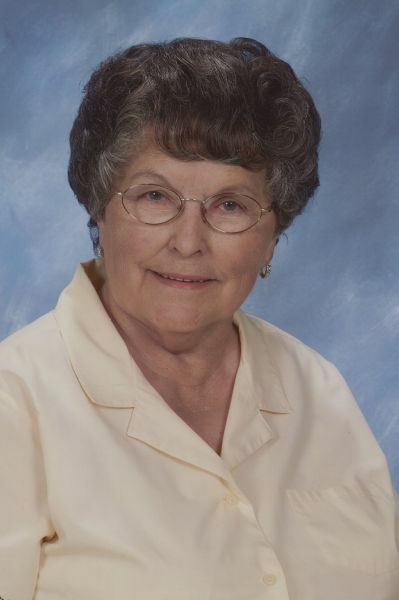 She was an active member of the Holy Rosary Catholic Church, where she was a member of the Daughters of Isabella, holding several offices, served as President of Ladies of St. Anne, and was past president of the Knights of Columbus Ladies Auxiliary. She was also involved in the Blanket Ministry, served as a Eucharistic Minister, church greeter, and in more recent years was very active in serving as co-coordinator for many funeral receptions at the church. She married Eddie Bishop on November 25, 1954 and he predeceased her in 1988. Mrs. Bishop was also predeceased by her son David in 1962. She is survived by one son and daughter-in-law Robert and Cheryl Bishop of Caribou, two daughters and sons-in-law, Vicky and Edward Bolstridge of Fort Fairfield and Connie and Thomas Shell of Hope. One brother and sister-in-law, Robert and Betty Thibodeau of Raymond, NH, one sister and brother-in-law, Maxine and Gilbert Bell of Caribou. Four beloved grandchildren, Nicole Pecori and husband John, Katherine Gorneault and husband Joseph, Amanda Bolstridge and fiancé Stephen Cyr and Ashley Shell and fiancé Cody Thieverge. Her great-grandchildren Kassidy and Gavin Gorneault, Danyka Haver, Aryel Thieverge, Alessandra and Giada Pecori, several sisters-in-law and brothers-in-law, many nieces, nephews and special friends. Mrs. Bishop was predeceased her brothers Mack, Frank, Leo, and Father Clement Thibodeau, sisters Mae Chamberlain and Rachel Saucier. Friends may call at the Mockler Funeral Home, 24 Reservoir Street, Caribou, 6 – 8 p.m. Thursday, July 5, 2018. A Mass of Christian Burial will be celebrated 11:00 a.m. Friday, from the Parish of the Precious Blood, Holy Rosary Catholic Church with Father David Raymond officiating. Interment will be at the Old Holy Rosary Cemetery. Following the services all are invited to a time of continued fellowship and refreshments at the Parish Hall. Friends who wish to contribute in Mrs. Bishop’s memory may do so by making contributions to the charity of their choice.